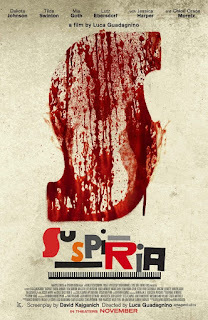 Director Luca Guadagnino’s interpretation of Suspiria, Dario Argento’s 1977 cult-classic, supernatural horror film, is ambitious, overstuffed, and dazzlingly convoluted—in other words, it’s brilliant. The film—as an overarching metaphor for insurrection and the transference of power—works on almost every level and establishes itself as less a remake and more a companion piece to Argento’s classic. Guadagnino’s take is set against the riotous backdrop of a wall-divided, post-war Germany circa 1977, terror-ravaged by Red Army Faction bombings and background news reports chronicling the hijacking of a commercial airliner. Into this sociopolitical bedlam—which is largely superfluous to the film’s narrative—enters Susie (Dakota Johnson), a talented but inexperienced dancer (and former Mennonite) from Ohio who shows up at a legendary all-female dance company in Berlin for a long-shot audition. As luck would have it, a roster spot has opened up after another dancer goes MIA, and her subsequent impromptu audition draws both the attention and tacit approval of the company’s enigmatic artistic director Madame Blanc (the unrivaled Tilda Swinton in yet another memorable role…or three). The preternaturally gifted Susie quickly ascends the ranks as Blanc's protégé, earning her the role of the protagonist in the company’s upcoming recital of Volk, which we quickly surmise has all manner of consequential otherworldly implications. 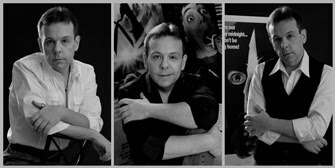 While most of the hallmarks of Dario Argento’s original giallo are present and accounted for, Guadagnino and screenwriter David Kajganich add a new character named Dr. Josef Klemperer, who is introduced in the updated film’s first few minutes. One of the elderly psychotherapist’s patients is a student from the dance academy named Patricia (whose mania is played well by Chloe Grace Moretz) who rants about a coven of witches that controls Markos Dance Academy and the evil of “the Three Mothers”—a witch mythology Argento refashioned from the writings of Thomas de Quincey—in a nice meta-tribute to Argento’s original trilogy. Klemperer—haunted by the wife he lost in World War II and stricken with an all-consuming survivor's guilt—is particularly invested in helping Patricia. 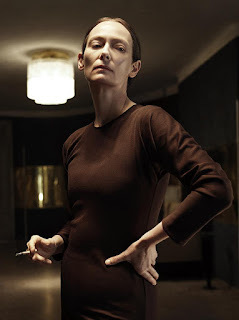 The character is played by a first-time actor credited as Lutz Ebersdorf—but it’s largely known now that the role is played by Swinton in drag. There could be much said here about Guadagnino’s choice with this bit of stunt casting in terms of feminist themes and gender fluidity, but the casting largely misfires because he’s generously peppered the entire film with so much thematically elsewhere. 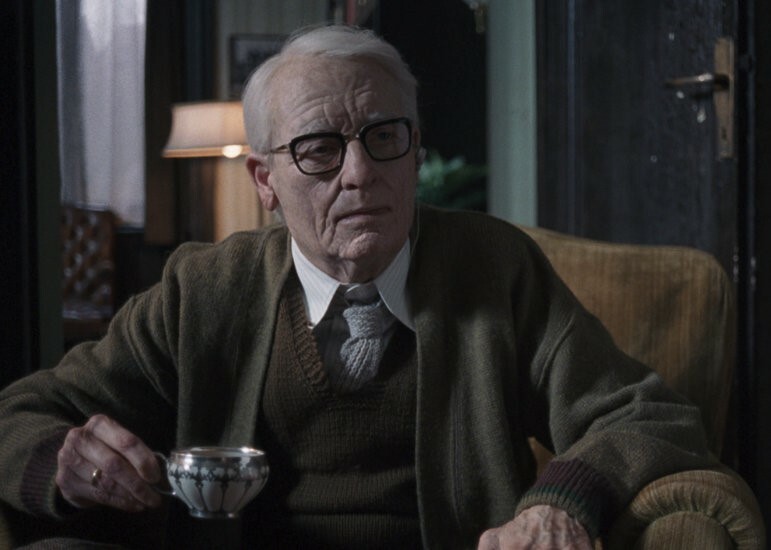 One legacy of the reimagined Suspiria that’s a given: The film will give film scholars and other academics years of material to dissect. On the surface, Suspiria is an odd choice for the Italian director after the blockbuster success of his plaintive coming-of-age romance of last year’s sublime Call Me by Your Name. Trading in the sun-dappled Italian vistas of his previous film for the darker muted tones of the grittier, concrete jungle of post-war Berlin here, Guadagnino—aided by the superb camerawork of cinematographer Sayombhu Mukdeeprom—creates a purposeful contradiction to the Technicolor palette and deep jewel tones of Argento’s original. He opts for a severe and dispiriting look, its colorlessness periodically punctuated by vivid slashes of blood red to excellent dramatic effect. Mukdeeprom’s abrupt, purposefully clumsy whip-zooms charging toward the actors and the unexpected acceleration of cuts during otherwise unhurried scenes lends the film an authentic 1970s aesthetic that unites the two set design approaches. Argento’s original Suspiria vision established tone largely through set design; Guadagnino opts to use dramatic choreography (mad props to choreographer Damien Jalet) to establish mood and escalate tension. Early on in the film, there’s a gut-churningly intense set-piece in which Susie’s feverish Salome-esque dance for Madame Blanc is juxtaposed against another dancer—whose attempt to flee the academy is thwarted by witchery—whose body is tossed around an adjacent dance studio and contorted in the most unearthly ways until she’s nothing but a protuberance of broken, misplaced bones. Aided by Walter Fasano’s precision-point editing, the scene is a strikingly gross yet captivatingly poetic bit of body horror. Likewise, Guadagnino opts to choose his own fork in the road instead of following Argento down the same path he took with the original film’s score. That score—by Italian prog-rock band Goblin—was an intense wall of sound that blended screaming guitars, synthesizers, and wordless vocals to create an almost-deafening sound that matched the off-kilter, horror-schlock ambiance and garish visuals of Argento’s film. For his Suspiria, Guadagnino counters by engaging Radiohead’s Thom Yorke, who ably captures the idea of descending into madness with his intricately languorous and brooding updated score. Suspiria ’18 is a bold revisionist interpretation of Argento’s unassailable masterpiece, a refreshingly challenging film infused with an almost existentialist sense of dread. It’s a hypnotic exploration of the catharsis of female rage in which witches cast their spells through dance and, in the end, the ugliness of destruction is offset by the beauty of unexpected absolution. It’s a film that demands repeat viewings, if only to unpack its layers of themes. 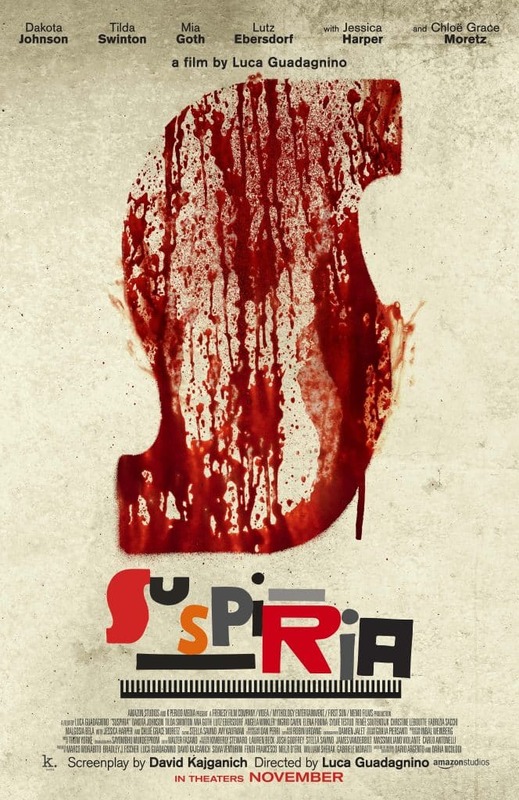 Loyalists are certain to appreciate Guadagnino’s inclusion of a touching cameo by Jessica Harper (the original film’s heroine) but fans expecting jump scares and a clean, linear narrative should look elsewhere; Guadagnino’s modern re-telling is a dense and cerebral slice of arthouse that’s as satisfyingly trippy as the original in its own right.